This van belongs to a man & woman travelling around selling nick nacks. My cousin snapped the photo somewhere near Coffs Harbour, Australia. I dig the cool yellow sun around the window. This week's MYM is now closed. Thanks for participating and see you next week! Until then, click on the links below for lots of great yellow photos. You dig only that sun? I think it's so cool would live in it at summer. Happy MYM! Well, mostly 'cause it's yellow - I mean that is the theme afterall ;) But yeah, that would be a cool way to travel around. That is so unique! Individuality on wheels! That's pretty cool. It reminds me of the sort of thing that I used to see in the 1970's but rarely anymore. Oh oh Was I only suppose to post one photo?? Love the trailer. Very "gypsy" style. What a cool transportation! Never seen one like that before! I dig the woodwork and the carriage lights at the entry. You wouldn't lose that in a parking lot! Clever way to leverage the round shape of the window - I like it too! 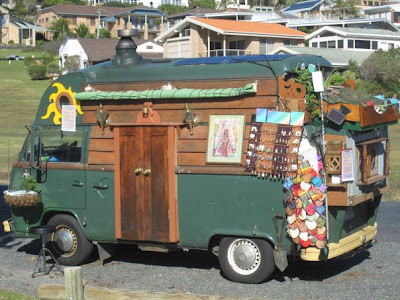 That is so cool- a 70's VW bus....hippie style! I love it. How fun in looks and in travel. I am sure they must enjoy the attention it must bring. I love your sun Drowsey!!! Oh wow, I bet that's the only wheels like that anywhere on the planet. Everyone needs a little sun! This takes me back a few years...how cool is this!! It's obviously been looked after with love! Great pic. Mine will be up tomorrow/ Monday at 10. Fabulous, totally love this picture. That is a wild looking van! Happy Mellow Yellow Monday to you, Drowsey! That van is so cute! That looks like something out of a movie. Cool van. We have a similar art van that travels to our local college once a year. I found you through a meme on a post by Hipchick on Blue Monday. I'm glad I found you! cool travelling van! and the yellow sun is a sure marker... you wouldn't have a hard time finding that one in a sea of vehicles! What a very cool idea. Instead of one fixed shop, they just drive around. And that van is just cute. That flower gives it a little extra cozyness. very very fantastic for me !! That's an old van. Looks like in the 70's. I wonder how you'd call the big yellow thing I have in my blog today? Neat buss, it takes me right back to the 70s when my friend had a 2 tone VW van. She went across the country to British Columbia and had a great time. My parents wouldn't let me go ;( But ahh for the short weekend trips. A nice splash of yellow on that van. a unique place to live it... nice..
What a cool van! It must be a VW. Happy Mellow Yellow Monday, everyone!!!! It sort of gives meaning to the idea of taking your cabin with you. Or like the snail.. carrying your home on your back! Colorful van - reminds of the hippie days of years ago! Ah ... reminds ME of my younger dayz. Haha maybe i can call that "running house"....i like it..very unique. Happy MYM. What a clever home. Thanks for posting on Mellow Yellow Monday. and I invite you to do the same. It`s all about how to choose a correct partner who uses your funds in a right way - that`s AimTrust!.